This detail from a map of the Southern states by J.H. Colon (1800-93) is from 1861 and shows a complete view of the Mason-Dixon Line—the long horizontal line and the vertical line that drops from its right end—as well as the other borders of pink-shaded Maryland. 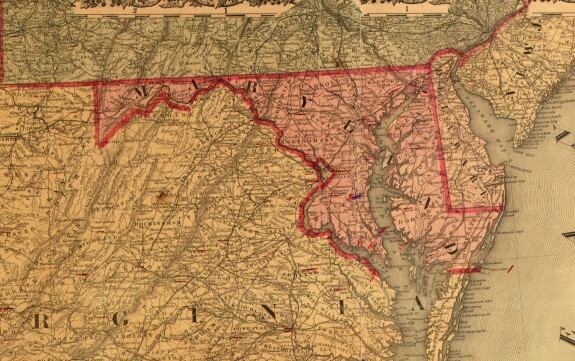 Though many associate the Mason-Dixon Line with the Confederacy and the South, Maryland was a border state and never formally seceded from the Union. Delaware, to the east of Maryland and also below the Mason-Dixon Line, followed a similar path. Maryland’s border with Virginia is a more accurate delineation between the Northern and Southern states. In 1863, two years after the creation of this map, West Virginia broke from the rest of Virginia to become a border state, while the bulk of Virginia seceded from the Union and joined the Confederacy. Crossing borders between U.S. states is often uneventful, marked only by a road sign or the appearance of a visitors center. But for those traveling among Maryland, Pennsylvania, and Delaware, crossing the state line often carries a larger significance. When the Mason-Dixon Line was first surveyed in the eighteenth century, small stones placed every mile and larger stones, called crownstones, every five miles, demarcated the line. In the twenty-first century, many of the stones have eroded away or been buried, but some are still visible and a handful have been preserved. 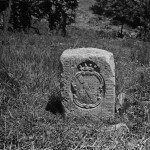 This photograph shows a crownstone in Zora, Maryland. 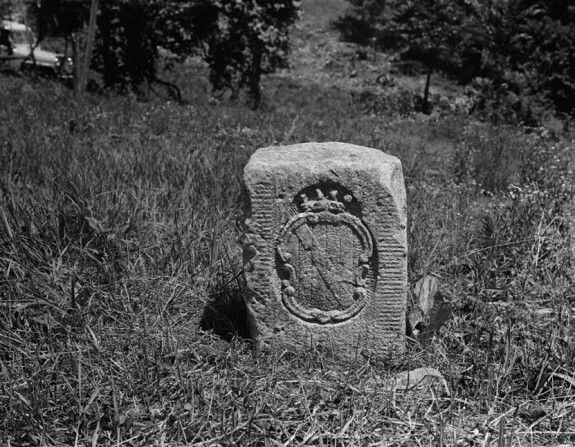 The Maryland side of the stones was engraved with the seal of the second Lord Baltimore, seen here, and the Pennsylvania side showed William Penn’s coat of arms, so travelers might know upon what side of the famed line they stood. 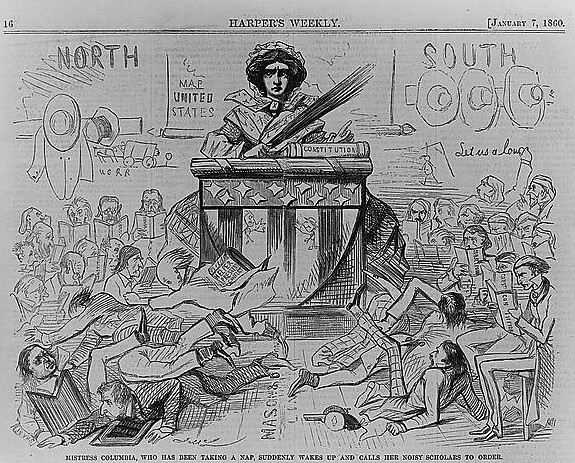 A political cartoonist captioned this, “Mistress Columbia, who has been taking a nap, suddenly wakes up and calls her noisy scholars to order.” Northern and Southern congressmen flank both sides of the image, and some seem to have been fighting across the dividing line between them marked “Mason & Dixon.” As with Columbia, personified often in cartoons as a woman upholding justice, the Mason-Dixon Line became a motif of political drawings during the Civil War and beyond. 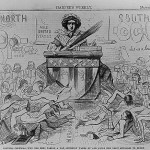 Though the line is not the actual divider between the Northern and Southern states, popular belief to the contrary has secured this role in the public’s memory. The Mason-Dixon Line, which settled a border dispute dating back to the founding of Philadelphia, is the southern boundary of Pennsylvania. Originally surveyed by Englishmen Charles Mason (1728-86) and Jeremiah Dixon (1733-79), the line separates Pennsylvania from Maryland and West Virginia along the 39º43ˊ N. parallel and bounds Delaware along an arc that extends from Maryland to the Delaware River. During the nineteenth century the line became a symbolic boundary between the southern and northern United States. The territorial dispute between Maryland and Pennsylvania began immediately after King Charles II gave William Penn (1644-1718) a charter to settle the lands between New York and Maryland in 1681. The charter set Pennsylvania’s southern boundary at the fortieth parallel, but the proprietors of both Maryland and Pennsylvania hoped to take advantage of the charter’s ambiguities. Pennsylvanians tried to push the boundary farther south and gain a port on the headwaters of the Chesapeake Bay. 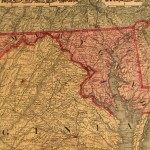 Marylanders contended that because Philadelphia is below the fortieth parallel, the city should actually be in Maryland. In 1732 the British Board of Trade set the boundary about fifteen miles south of Philadelphia, though attempts to survey this line were abortive. Colonists on both sides forced the issue by settling on disputed lands and these perceived incursions, many of which were instigated by Marylander Thomas Cresap (1702-90), led to violence. In 1750, commissioners from both colonies agreed to run a border according to the 1732 agreement and, after struggling to conduct an accurate survey in the early 1760s, asked England’s Astronomer Royal for help. He sent Mason and Dixon. Mason and Dixon arrived in Philadelphia in November 1763 while Pennsylvania was caught up in a cycle of increasingly racialized atrocities between whites and Natives, including the Paxton Boys’ massacre. Using state-of-the-art astronomical apparatus, Mason and Dixon surveyed borders between Delaware, Maryland, and Pennsylvania. In 1767, with the help of Iroquois guides, Mason and Dixon tried to extend their line west of the Royal Proclamation Line, which British officials had created in 1763 to regulate the expansion of white colonists into Indian lands across the Appalachian Mountains. But the threat of violence from Delaware Indians, who were then disputing Pennsylvanians’ and Iroquois claims to their territory, forced the expedition to turn back. In 1784, astronomers Andrew Ellicott (1754-1820) and David Rittenhouse (1732-96) ran the boundary to its intended endpoint—five degrees west of the Delaware River. During the antebellum era, Americans began to identify the Mason-Dixon Line as delineating the northern and southern sections of the United States. But the line was never a clear boundary between a world where slavery ruled and one where freedom rang. Various forms of free and coerced labor existed along both sides of the line and southern slave owners maintained the legal right to recover enslaved blacks who fled north of the 39º43ˊ parallel. Although many whites in Maryland, Delaware, and even Philadelphia sought to preserve racial slavery, the proximity of the line and the freedom it promised to runaway slaves forced planters in Maryland and Delaware to experiment with a wide variety of labor regimes. By 1860, large landowners in Maryland and Delaware had become far less dependent on slave labor than those in the Lower South and, ultimately, unwilling to join the confederacy, a crucial factor in the North’s eventual victory. For many Americans, the line has remained the iconic boundary between Northern and Southern cultures. Cameron B. Strang is an Assistant Professor of History at the University of Nevada, Reno. Cope, Thomas D. “Degrees Along the West Line: The Parallel between Maryland and Pennsylvania.” Proceedings of the American Philosophical Society, vol. 94 (1950), 260-8. Danson, Edwin. Drawing the Line: How Mason and Dixon Surveyed the Most Famous Border in America. New York: Wiley, 2008. Davenport, John C. The Mason-Dixon Line. New York: Infobase Publishing, 2004. Grivno, Max. Gleanings of Freedom: Free and Slave Labor along the Mason-Dixon Line, 1790-1860. Champaign: University of Illinois Press, 2011. Mason, Charles. The Journal of Charles Mason and Jeremiah Dixon. Transcribed by A. Hughlett Mason. Philadelphia: American Philosophical Society, 1969. Strang, Cameron B. “The Mason-Dixon and Proclamation Lines: Land Surveying and Native Americans in Pennsylvania’s Borderlands.” The Pennsylvania Magazine of History and Biography, vol. 136, no. 1 (Jan. 2012), 5-23. Walker, Sally M. Boundaries: How the Mason-Dixon Line Settled a Family Feud and Divided a Nation. Somerville, Mass. : Candlewick Press, 2014. Minutes and Papers of the Mason and Dixon Survey, American Philosophical Society, 104 Fifth Street, Philadelphia. Correspondence and Accounts of the Mason and Dixon Survey, 1758-1769, American Philosophical Society, 104 Fifth Street, Philadelphia. [Mason, Charles]. Journal during the survey of the Pennsylvania-Maryland line, 1763-1768, American Philosophical Society, 104 Fifth Street, Philadelphia. Minutes, 1754-1762, of the commissioners for determining the line between Pennsylvania and Maryland, American Philosophical Society, 104 Fifth Street, Philadelphia. Mason-Dixon Line papers, 1701-1881, Historical Society of Pennsylvania, 1300 Locust Street, Philadelphia. 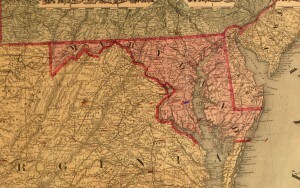 The “Post Mark’d West,” the initial point of the Pennsylvania-Maryland boundary that Mason and Dixon established in 1764. White Clay Creek State Park, Del.